A lesion is a general term referring to an abnormality in the tissue. Lesions may be flat or raised, ulcerated, painful, acute or chronic, and have different causes. Whatever the cause or appearance, a lesion is not normal and must be evaluated and treated. White lesions are quite common and may be completely benign or precursor of cancer tissues. Majority of white lesions that are flat are related to irritation and are known as hyperparakeratosis. They may also be in response to fungal infections. More concerning is the white lesions that are precursors of neoplasm (tumor). Early neoplastic changes can appear white and may represent dysplasia (involving partial thickness of the mucosa) or carcinoma-in-situ (involving full thickness of mucosa). A biopsy must be done as soon as possible to establish diagnosis. If neoplastic changes are noted, further treatment may be recommended. 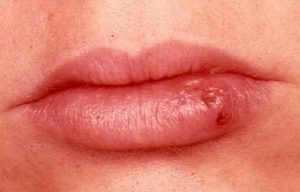 One such common lesion is known as Lichen Planus. Pigmented lesions present as brown, red, purple, blue, or in combinations of. The most concerning pigmented lesion is melanoma, which is cancerous and can appear brownish. 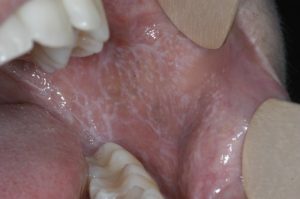 Red lesions may represent precursor to oral cancer, especially when they are mixed with white lesions. Red or purple lesions may represent a hematoma, which is a benign vascular lesion. Blue-purple lesions are mostly nevus (similar to a birth mark), which are also benign. A biopsy is recommended to establish diagnosis. Ulcers are lesions that have lost their surface covering and are frequently painful. They may be due to irritation or trauma, bacterial / fungal, or oral cancer. Most ulcers that are reactive or due to irritation are benign and heal spontaneously. However, any ulcers that do not heal after 10 to 14 days may be oral cancer and should be evaluated immediately. Such ulcers are of particular concern when they occur under or side of the tongue, floor of mouth, or in the back near the throat. How do I know if something is cancer? Cancerous lesions may have all or some of the following characteristics: Painful, ulcerated, rapidly growing, broad-base and attached to the underlying tissue, numbness, irregular growth with rolling borders, and bleeding. Any lesions with such characteristics need immediate evaluation and biopsy.